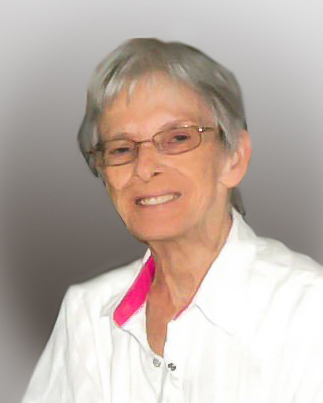 Obituary for Helen Josephine (Poage) Harris | Myers Funeral Home, Inc.
Fortified by the sacraments of the Catholic Church and surrounded by her family, Helen Josephine Harris, 74, of Wellsville, peacefully passed away Friday, March 29, 2019 at her home. Helen was born August 4, 1944 in rural Wellsville, Missouri, a daughter of William Addison and Theresa (Fennewald) Poage. Helen contracted and showed symptoms of polio at the age of one. She had her first of twelve knee surgeries at age three. Helen wore braces up to her hip on both legs until the age of eight when she started wearing one brace on her left leg for the rest of her life. Despite being told she would be unable to have children, she overcame the impossible, having two sons. Although polio affected her physically, it strengthened her mentally, emotionally, and spiritually. She married William Otto Fischer in 1964 in Montgomery City, Missouri. On December 14, 1968 at Resurrection Catholic Church in Wellsville, Missouri, she married Gary Lee Harris, sharing over 50 years together. They lived all of their married life in Wellsville. Helen became a licensed cosmetologist in 1963. She was a homemaker and a housewife. Helen had previously worked at Jonesburg Shoe Factory and Tip Top Café. She was a member of Church of the Resurrection in Wellsville. Helen enjoyed gardening, dancing and working jigsaw puzzles. She was known and respected for her toughness and living a life without limitations. More than anything, she loved being with her family, especially her grandchildren. Helen is survived by her husband, Gary Lee Harris, of the home in Wellsville; sons, Jerry W. Fischer and wife, Rose, of Wellsville and Myron W. Harris and wife, Dawn, of Hermann; four grandchildren, Brittney Lynn Boemer and husband, Chris, of Wellsville, Cody Allen Fischer, of Wellsville, Matthew William Christopher Harris, of Montgomery City and Sarah Elizabeth Harris, of Hermann; two great-grandchildren, Kennedy Renee’ Boemer, of Wellsville and Allen Matthew Harris, of Montgomery City; sisters, Mary Hoard, of Wellsville and Barbara Kramer, of New Florence; in addition to nieces, nephews and cousins. She was preceded in death by her parents; brother-in-law, Kenny Kramer and nephews, Kenneth Kramer, Jr. and Darrell Hoard. Visitation was held from 5:00 – 8:00 p.m., with Rosary at 8:00 p.m., Monday, April 8, 2019 at the Myers Funeral Home in Wellsville. Mass of Christian Burial was at 10:00 a.m., Tuesday, April 9, 2019 at Church of the Resurrection in Wellsville. Father Augustine Okoli, Father Greg Oligschlaeger and Deacon Ron Deimeke officiated. Serving as cantor was granddaughter, Sarah Harris. Organist was Palmyra Dubbert. Burial was in Wellsville Cemetery. Serving as pallbearers were Chris Boemer, Cody Fischer, Matt Harris, Scott McCaw, JD Mitchell and Tim Taylor. Honorary pallbearers were Les Davis, Joan Hank, Francis Harlan, Willie Harlan and Mac Lewis. Memorial contributions were suggested to the Church of the Resurrection c/o Myers Funeral Home, 203 East Bates Street, Wellsville, MO 63384.